Some online slots leave absolutely no doubt as to their theme and Glitter Gems is one such game; it’s all about gigantic sparkling jewels, perhaps the type of objects we’ll be able to afford when that jackpot win comes in. This one’s developed by Ainsworth Gaming Technology and it comes an enhanced free spins round. Glitter Gems is a five reel slot with three rows and up to thirty paylines; those bronze-framed starry reels float against a backdrop of dappled blue to create either an atmosphere of luxury or bad taste depending on your viewpoint. The high value symbols are red, sevens, purple sevens, jewel-encrusted dollar signs, dice and a golden diamond; 9, 10, J, Q, K and A represent the lower values. The Glitter Gems logo is wild, it appears only on reels three, four and five and it will substitute for all others to help form winning combinations except for the blue diamond scatter symbol. This is triggered by landing three or more of the blue diamond scatter symbols anywhere in view for which you will receive an initial eight free spins but an extra five can be awarded if you can land three more scatters during this round. There’s a bit extra going on during this round because not only does the Glitter Gems wild appear on all reels but the red and purple sevens can pay out as a mixed combo – 25x your line stake for five on a payline. In addition any wins will be subject to a 2x multiplier. 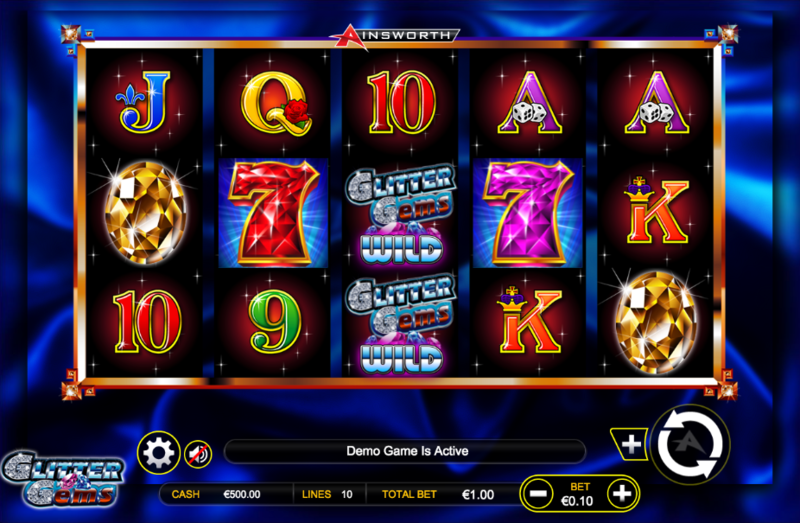 Ainsworth slots have a very individual look which could probably not be described as state of the art but Glitter Gems is a very playable game with some big, bold colours and gameplay which ticks along nicely. The free spins offer a bit extra and there’s an RTP of 94.25%.